Just a couple of years ago, Minnesota's iron mining industry looked to be going the way of buggy manufacturing and steam locomotives. Over the 20th century, Minnesota provided the iron that built much of the country. But early in the 21st, the mines were struggling to compete with low cost iron from other countries. And then, a surge in global demand for iron and steel put new life into northeast Minnesota's gaping open-pit mines. But global trade can be a double-edged sword. It can create prosperity, and it can take it away. Duluth, Minn. — Two years ago things were looking bleak in Eveleth. Evtac, the town's biggest employer, had just shut down. Steelworkers local president Joe Strlekar was one of 450 mine workers who'd lost their jobs. "It was fairly devastating to the area," Strlekar says. "There were still some mines that were running, but the prospects certainly weren't looking good at the time." If Evtac's closing wasn't the end of Minnesota iron mining, you'd have sworn the end wasn't far off. Two years before, in 2001, LTV Steel gated its taconite mines near Hoyt Lakes, not far from Eveleth. That one took 1,400 jobs. In this part of the state called the Iron Range, iron mining was disappearing. American steel mills were using more cheap iron imports and less Minnesota ore. The region's five remaining mines were rapidly consolidating, closing production lines and cutting positions. And then everything changed - almost overnight. There was an unprecedented building boom on the other side of the globe. China needed lots of iron, and needed it quickly. "North American pellets end up in China, which before, had been unheard of," says Joe Strlekar. Evtac was back in business. Now called United Taconite, the new company is a partnership between Ohio based Cleveland Cliffs Corporation, and Chinese steel maker Laiwu. Strlekar says Chinese steel mills were famished for iron. "With their rapid expansion in their steel industry, and worldwide, the demand going up, Brazil and Australia and the other places that were supplying China could no longer supply their needs," Strkelar says. A diversified economy is a sustainable economy. Today, global demand has pushed up the prices for American made steel and American mined ore. It's restored production at Minnesota's iron mining companies. And the prosperity spills out to support industries from mining truck maintenance to railroads and Great Lakes shipping. Today Minnesota iron mining is clearly a winner in the battle for global trade. But tomorrow, Minnesota might be another loser. In the new economic order dubbed globalism, only the leanest, and the best positioned can win. Jim Skurla monitors the mining industry from the University of Minnesota-Duluth. Skurla says, there's so much demand now that American steel companies are thriving. But new competition is on the horizon. "Other countries, like Brazil, Australia, are projecting big, huge plants that are coming online by as early as 2007," Skurla says. "And when that happens, the capacity is going to increase rapidly for the production of steel and taconite, or other sources of steel products." Meanwhile, China is striving to become more independent in both iron ore and steel production. "That's the one big unknown, that we don't know, is how fast that China will come on board," says Skurla. "And even the other countries, like Asia; there's a tremendous amount of demand for steel products, all over the world. There's a global demand for this stuff. And it's a combination of all those that we kind of have to work on. And the problem is that nobody knows." Globalism also brings new owners into the picture, with potential consequences for Minnesota. Today, China's Laiwu Steel holds a minority position in Eveleth's United Taconite. Netherlands-based Mittal Steel has acquired one Minnesota mine and holds a share of another. Jim Skurla says global ownership leads to global decisions, that don't always have a local community's best interests at heart. "When they're looking at the global market, these are now just one of many, many plants that they're looking at," says Skurla. "So that this idea of how it's going to affect the home town, or how it's going to affect the (Iron)Range; a lot of times they're not interested in that, or that doesn't play into the decision-making process at all." Predictably, the rush to globalism has its critics. Some say there's more at risk in the global marketplace than Minnesota jobs. Joel Sipress follows labor history as a Professor at the University of Wisconsin-Superior. "The question we should be asking is how can we write rules for a global economy that provides some measure of fairness to people who work in the iron mining and steel industries, whether it's in northern Minnesota or in other parts of the world," says Sipress. Sipress worries about what's often referred to as "the level playing field." Many countries have lower wage levels than the United States. Workers in developing countries face potential exploitation, while U-S workers face lower wages and working standards as their employers struggle to compete. And many developing countries have weak environmental regulations. "If we don't have some strong global environmental standards, we stand to see our jobs lost to those parts of the world that have lax environmental standards, and we stand to see continued downward pressure on this country's environmental standards," Sipress says. But Sipress doesn't lay all the blame overseas. He says wage and environmental protections have been left out of trade agreements signed by the United States. "I'd say right now the United States Government is the chief barrier in the world to the development of those kinds of standards," says Sipress. Minnesota mines pay high wages, and the state's known for stringent environmental regulation. Furthermore, in the center of a continent, the state's far from overseas markets. 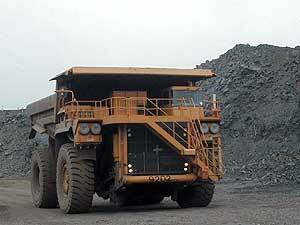 Minnesota mines will be hard pressed to compete head-to-head with mining in developing countries. So Minnesota needs another approach. Sandy Layman heads a state development agency called Iron Range Resources. Layman says Minnesota holds only four percent of the world's iron resources. "Minnesota's a big player there, but in the global scheme of things a pretty small player," says Layman. "So at any point in time the users of iron ore could go to other sources." Her agency works to develop business that's unrelated to iron mining. New jobs have come in areas like health care, and travel services - jobs that should still be viable the next time iron mining goes into decline. "We need to continually be looking at diversification," Layman says. "A diversified economy is a sustainable economy." And the state is pursuing new technologies to take the state's iron production to another level. One project will make a higher content iron pellet - an iron nugget. Nuggets can be sold to traditional blast furnace steel mills, or newer mini-mills with electric arc furnaces. Another project would make rolls of steel, for the first time, in a plant next to a Minnesota iron mine. "We need to be not only diversified but adding value, so that we're not just shipping out the ore product, but we're making the products here in the state of Minnesota," Layman says. Through Iron Range Resources, the State of Minnesota is invested in both projects. "It's a long shot, and one of the roles we play is in early stage development of projects that are long shots," Layman says. "But, it's very important to our future that we add value to the natural resources that are here." In a global economy, products like iron nuggets and steel could buy time for Minnesota's iron industry. The challenge will be, staying a step ahead of the global competition.